Mike Mohammed has been teaching high school science for 17 years. He has been teaching at Brookfield High School for the last 14 of those. Mike attended UW Madison where he received his degree in Secondary Education in Broadfield Science and Biology with additional certifications in chemistry and physics. In his time at Brookfield Central, Mike has taught Biology, Chemistry, Physics, and General Science. He is currently teaching Physics and AP Physics. His interests in education focus on putting students at the center of their own learning experience. He lives in Brown Deer, WI with his wife. Google “Spark”: When I first learned of Google Docs and Google Drive it was amazing that student documents could be accessed across multiple devices without the need for a floppy disk or thumb drive to bring to the computer lab. This was especially key when I got a class set of iPads. This may have been the gateway, but it was still just word processing. The major sparks were realizing the options for varied expression, ability to use Doctopus to distribute templates to the learner and provide digital feedback via comments. Shannan Lewellen (Las Vegas, NV) - I wanted to share how I recently used a google add-on in my Science classroom. 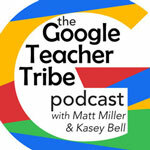 Matt - 101 Google lesson ideas in a FREE ebook!